Click the "Import Contacts" command on the File menu. 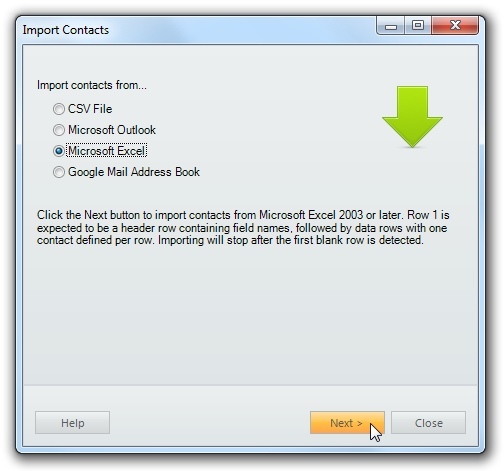 Right-click the Contacts List and select "Import Contacts" from the popup menu. Click the "Import Contacts" button at the top of the Contact Editor. Contact data can be imported from CSV files, Microsoft Outlook (2003 or later), Microsoft Excel (2003 or later), and Google Mail's Address Book. After selecting the desired import source, click the Next button. 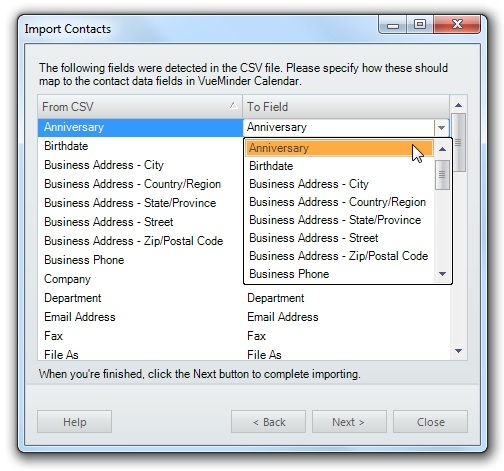 The imported contact data will appear in the Contact List and can be edited using the Contact Editor. You can also export contact data using the Export Contacts command on the File menu. When you have finished specifying the field mappings, click the Next button. The contact data will be imported. If contacts already exist having the same File As value as contacts being imported, they will be updated instead of duplicated. After the import completes, a list of updated or added contacts will be shown. A similar results window will also be shown after importing from Excel, Outlook, or Google Mail. Note, this requires Outlook 2010 or later. Also, contacts will be imported from the default "Contacts" folder and any of its subfolders. 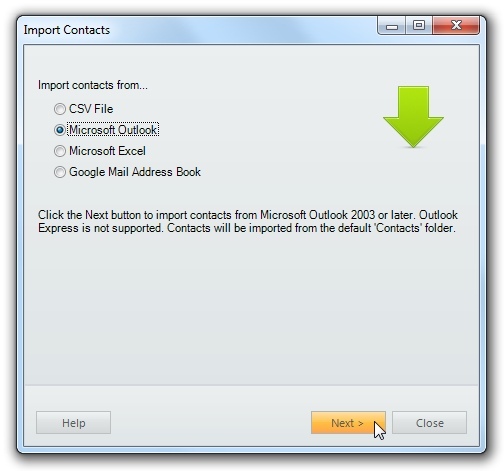 If you store contact data elsewhere, it will need to be moved into Outlook's "Contacts" folder before it can be imported. The "Folder List" view in Outlook can be used to accomplish this. After clicking Next, the import process will begin. Depending on the number of contacts stored in Outlook, this could take between a few seconds to several minutes. 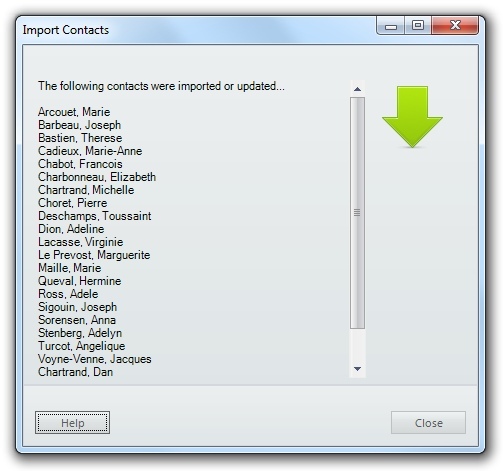 After the import is completed, a list of updated or added contacts will be shown. Contacts that were in subfolders will have their "Group/folder" property initialized to the name of the subfolder in Outlook. To import from an Excel workbook, select Microsoft Excel as the source and click the Next button. Note, the contact data needs to be on the first worksheet within the workbook. Also, the first row is expected to be a header row containing field names, followed by data rows, with one contact defined per row. Importing will stop after the first blank row is detected. After clicking Next, a file browser will be shown, where you can locate and select the workbook file to be imported. After selecting a file, the window will update to list the fields detected in the workbook and enable those fields to be mapped to equivalent fields in VueMinder. Some mappings will be automatically filled in, if VueMinder recognizes the source field name. If the source field name is not recognized and the Ultimate version is being used, the destination field will be a new custom field and highlighted yellow to indicate a custom field will be created. To specify or override a field mapping, select the desired "To" field from a drop-down list. To remove a mapping, select the blank entry at the top of the drop-down list. When you have finished specifying the field mappings, click the Next button. The contact data will be imported. If contacts already exist having the same File As value as contacts being imported, they will be updated instead of duplicated. After the import completes, a list of updated or added contacts will be shown. 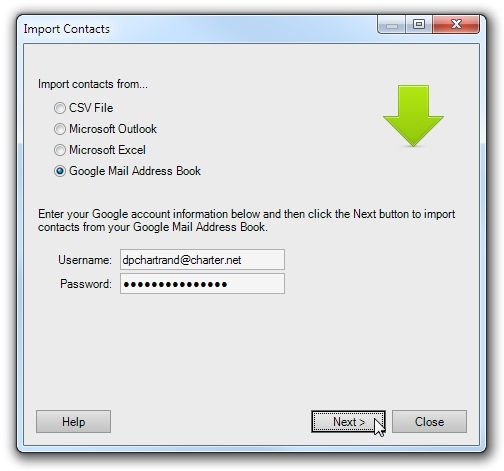 To import from your Google Mail address book, select Google Mail Address Book as the source. Enter your login information and then click the Next button.